Nquthu is a high-lying area, with altitudes ranging from 901 metres to 1 500 metres above sea level. It is drained by the Buffalo River and its small tributaries. The northern areas are higher-lying and undulating, while the southern areas are more mountainous. In the southern areas, slopes reach gradients greater than 20%, thus limiting settlement, while the northern areas are characterised by gentler gradients. The settlement pattern of Nquthu is largely dispersed rural settlements, with two urban centres of Nquthu town and Nondweni. It is clear from the current reality as well as from the Nquthu Socio-Economic Study that the two areas of Nquthu Town and Nondweni are the most popular in the area. The population is distributed throughout the Municipality, although the southern areas are less densely populated due to the topography. The settlement pattern within the rural part of Nquthu has been influenced by agricultural potential and access to physical and social infrastructure. The rural population depends on nearby semi-urban areas such as Nquthu Town and Nondweni for services because of the lack in basic services and social services within these rural areas. This again places enormous pressure on service delivery. The priority areas of intervention within the Municipality are Nquthu Town, Nondweni, Ngolokodo and Isandlwana, Masotsheni and Qhudeni. These are areas characterised by high concentrations of rural and poverty stricken population and where the backlogs in service provision, both social and engineering, are the most severe. Nquthu town is strongly linked to the surrounding towns of Dundee, Melmoth, Vryheid and Newcastle. Dundee provides many of the administrative and institutional needs, as well as serving as the commercial core for higher-order, wholesaling and light industrial activities and providing many employment opportunities for Nquthu town residents, particularly those in the southern portion of the municipality. Nquthu serves as a provincial administrative centre, with offices of the Departments of Education, Agriculture and Environmental Affairs, Works, Health, Justice and Welfare, Department of Transport, Safety and Security (SAPS), Post Office, as well as a variety of social infrastructure. Nquthu is located in crossroad of provincial roads, this place the node at a strategic position as an economic powerhouse and has the potential of growing as a Service Support Hub. Additional potential lies in the development and improvement of the commercial and property sector. Land use in Nquthu is primarily agriculture, mainly dryland subsistence, where people keep livestock and grow crops such as maize and beans. This is the predominant land use on the flat land and gentle slopes, and along watercourses. In the central and northern areas the other predominant land use is unimproved grassland, where livestock graze. In the southern areas, particularly in the steep slopes, the land has not been developed and has remained as thicket and bushlands. Other land uses in the municipality are limited to small areas of forest plantation in the central areas of Ward 6 and the urban built up residential areas of Nondweni, Nquthu town and Ngolokodo. The positions of the various British units who fought at the Battle of Isandlwana have been marked with whitewashed stones on the battlefield. 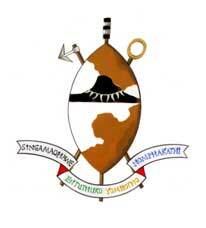 The annual re-enactment of the Battle of Isandlwana has now become a major tourist attraction in Nquthu Municipality. The crowd which attended the function in 2006 was estimated at 5000. 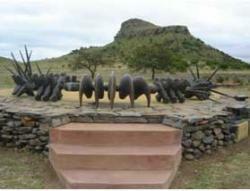 At present plans are in place to establish the world's sixth panorama at Isandlwana. Naturally, this will be done well away from the famous battleground. Just outside the village of Nondweni is a grove of trees surrounding a whitewashed cross and a low wall. It was here that Eugene Louis Napoleon, Prince Imperial of France, and aide-de-camp to Lord Chelmsford, was killed in an ambush in 1879. A number of projects have been identified that that can put this municipality in a very strong position and will encourage the financial growth and prosperity of the residents. Traditional Hub: Cultural Village, Arts and Craft Centre, Indlamu Academy, Exhibition Centre etc. Agricultural Projects: Chicken Farming, Cattle Farming, Piggery, Mushroom Plantations etc. To be the champions in the development of local economy and community development. Location of Head Office: Nquthu is 52 km east of Dundee (R68). Towns within the municipal boundaries: Jabavu, Maduladula, Mangeni, Masotsheni, Nondweni, Nqutu, Ntabebomvu, Silutshana. Nquthu is derived from the Zulu word "isingquthu", meaning the back part of the head.